One of the Force's most experienced detectives is about to retire. His professional experiences would probably fill a dozen or so books but he's not planning to write them, with or without help. Instead he will spend his time reading books on Chinese history, a subject that has always interested him but for which, until now, he could not find the time to study. After more than three decades of service Kowloon West's Senior Superintendent (Administration) Mr Chan Chin-cheung has only a few weeks to go before he puts his feet up and starts reading from a long list of Chinese History books he has compiled over the years. "I have been so busy," Mr Chan told OffBeat, "that I have never had the time to read every book I fancied reading. I'm looking forward to my retirement and a second, unpaid, career as a bookworm." Mr Chan joined the Force in 1971 in the second year of a matriculation course when he was offered inspectorate training at the Police Training School (PTS). After graduation he did a four-year stint with Marine Police in various posts before going to the Police Tactical Unit as a Platoon Commander. In 1976, he went to Tsuen Wan District first as head of a Divisional Investigation Team and then as head of a District Action Squad. It was there that he obtained the first two of six Commanding Officer's Commendations. In 1978, he moved again with a promotion to Senior Inspector, to the then New Territories (Traffic) as Officer-in-Charge of Tai Po Zone Enforcement & Control. This was followed in 1981 by a two-year posting to PTS as District Continuation Training Centre Commanding Instructor and, a year or so later, by a posting to Western District Action Squad as Officer-in-Charge. A most significant posting then followed. In May 1982 he went to Kowloon City Division Acting Divisional Commander (Crime). In July the same year he was promoted to Chief Inspector. Just about two years later, in 1984, he went to Tsim Sha Tsui Division as Assistant Divisional Commander (Crime). This was the posting that confirmed to Mr Chan and to senior management that he was an outstanding detective. During that posting he earned a Commissioner's Commendation. From 1986 to 1991, Mr Chan was employed in Kowloon East Regional Crime Unit V as Chief Inspector before going to the Organised Crime & Triad Bureau Special Investigation Unit Section as Commander for a very busy 18-month stint. It was during that time that he became heavily involved in the investigation of several complex cases that included the Wong Tak-fai Kidnapping, a major cash-in-transit armed robbery in which $167 million was stolen, and the apprehension of an extremely dangerous gang of armed robbers who had committed a total of at least 30 armed robberies over the previous three years. Rewarded with a promotion to Superintendent in July 1992, Mr Chan was posted to Sau Mau Ping District as the Assistant District Commander (Crime) and, a year later, Special Branch. In what became the most challenging and traumatic posting of all, in 1994 Mr Chan was appointed Detective Training School (DTS) Deputy Commandant. On 20 November 1996 the Garley Building Fire occurred and Mr Chan set up the Disaster Victims Identification Unit with students and staff from the DTS. "I will never forget that fire. None of us were emotionally prepared for the work that we had to do in appalling conditions. We relied on our discipline, teamwork, mutual support, and the knowledge that the job just had to be done. It was our duty! Our work really started immediately after the Fire Services declared the fire was out. They did not declare the building to be safe. It wasn't! But we had to go in and, starting on the top floor Jewellery Factory, identify the charred bodily remains of the victims, collect possible identification aids on or near them, place them in body bags and carry them half way down the building stairs until we reached a floor to which lift service was available. It was gruelling, hot, dirty and heartbreaking work. "After that we had to go to the Mortuary where victims relatives were waiting in anguish and anger to claim whatever remains there were. Of course, we had to clean up jewellery, etc, which might aid in identification, and we had to study medical and dental records surrendered by relatives and even arranged for some of the earliest DNA forensic tests. Eventually, we were able to positively identify the remains of every victim," said Mr Chan. "It still brings tears to my eyes when I recall the young man sitting quietly all alone in the mortuary when all around him were emotional people venting their frustration for an unbearable loss. I asked him if I could help him. He handed me the medical records of his wife. Then he burst into tears explaining that his wife, who worked in the top-floor jewellery factory had phoned him, explained that floor was on fire and asked him what to do. He had told her not to panic and to wait for the fire brigade. They then had what was to be their last conversation, she fell unconscious while he was still talking to her. He looked up at me and asked if he had given the right advice or should he have told her to run like hell. I did my best to reassure and comfort the young man," he said. "Later," he said, "I received a basket of fruit and a letter from the young man thanking me for all my staff had done to identify her body and allow him to give her a proper funeral." 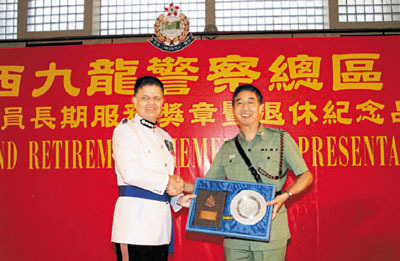 In 1997, Mr Chan was appointed New Territories South Senior Superintendent (Crime) Commander and then to the Commercial Crimes Bureau Fraud Division as Commander and later to the Counterfeit & Support Division until, in March 2002 took up his ultimate appointment in Kowloon West as Senior Superintendent (Administration). Mr Chan received six Commanding Officers Commendations, a Commissioner's Commendation and was awarded the Colonial Police Long Service Medal 1st Clasp and the Hong Kong Police Medal for Meritorious Service, 1st and 2nd Clasps. He also found time to gain a Master of Science (Business Engineering). "I have seen so many changes in the Force since I first joined," Mr Chan told OffBeat. "It seems that I have lived through three decades of almost constant change. The educational standards are so much higher nowadays and, of course, there is a much larger percentage of female officers. The biggest changes probably took place over the last decade and, on reflection, I can say that they have been changes for the better. I'm really proud of the Force's achievements and of serving with the officers who have made them possible," he concluded.